Located in the new business center, this Salzburg hotel is directly in the city center. The Renaissance Salzburg is easily within walking distance of many attractions, including the Hohensalzburg Fortress, the Old Town, Mozart's birthplace, the cathedral, and Mirabell Gardens. 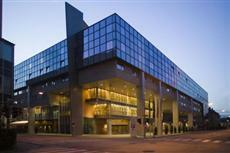 The Salzburg airport is located approximately ten kilometers from the Renaissance Salzburg Hotel. Public transportation is readily accessible, both by train and by bus. Many attractions are located within walking distance, but taxi services are also available. There is a network of bicycle paths, as well. The Renaissance Salzburg Hotel Congress boasts 257 guest rooms, ten of which are suites. Amenities available include wireless high-speed Internet, cable and satellite television, and a mini bar. The en suite bathrooms provide hair dryers and complimentary toiletries. The Renaissance Salzburg Congress is a modern facility that offers an on-site restaurant and bar, a swimming pool, a fully equipped fitness center, a sauna, banquet and conference facilities, and a hair salon. Child care and 24-hour front desk assistance are conveniences available to hotel guests.